A hillwalker has found an ice axe on Ben Nevis that could belong to a couple who went missing during a climbing trip over Valentines weekend. 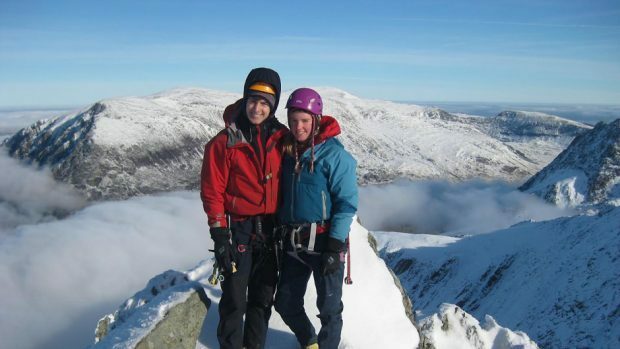 Experienced climbers Rachel Slater, 24, and Tim Newton, 27, were reported missing on February 15 after they failed to return from Lochaber. A huge search was launched for the couple, but was eventually called off after rescuers triggered a series of avalanches. However, their tent was found near the CIC hut on the Ben and Ms Slater’s car was found in the North Face Car Park – and Lochaber Mountain Rescue Team have vowed to continue looking for the couple until they find something. Last night team leader John Stevenson revealed a woman found an axe in the snow below The Shroud and Boomers Requiem climbs. Mr Stevenson said: “A woman found the axe, reported it and it has been recovered. “Anything we find is always a clue until we can dismiss it. He added that they needed to know if anyone else had left it there so they could eliminate it from their searches. Mr Stevenson said they had promised the couple’s families that they would keep looking for Ms Slater and Mr Newton. He said: “We are in regular contact with them and have told them we will keep going until we find something. “Team members have been going out in small groups in the recent good weather to look again at areas that we have previously searched. The team leader said they had re-searched Coire Eoghain, Five Finger Gully, Castle Coire through to No 5 Gully and had used a drone to search the Waterslide area. He said: “One of our boys has a drone so he took it up and did a bit of flying with it to take some pictures of the area. Anyone who has lost an ice axe in The Shroud and Boomers Requiem area or knows someone who left an axe there is asked to contact police on 101.